1. Preheat oven to 160deg C (fan)/180 deg C/350 deg F/gas mark 4. 2. Cream the butter and sugar in a bowl until the mixture is pale and smooth. Add the eggs, 1 at a time, mixing briefly after each addition. This can take a few minutes. Scrape down the sides of the bowl with a rubber spatula to ensure the mixture stays well combined. 3. Add the vanilla extract to the milk in a plastic measuring jug. 4. Combine the two flours in a separate bowl. 5. Add one-third of the flours to the combined butter and sugar mixture and beat well. Pour in one-third of the milk and beat again. Repeat these steps until all the flour and milk has been added. 6. 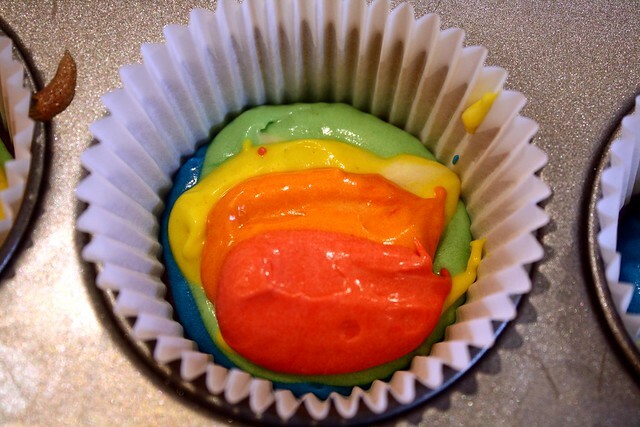 Divide the mixture into six bowls (about 2.5 tablespoons of batter in each) and mix each of your colours with the batter. I use gel colours, you just can't achieve this bright effect with liquid colors. I got mine in a set from this ebay seller for around £15. 7. 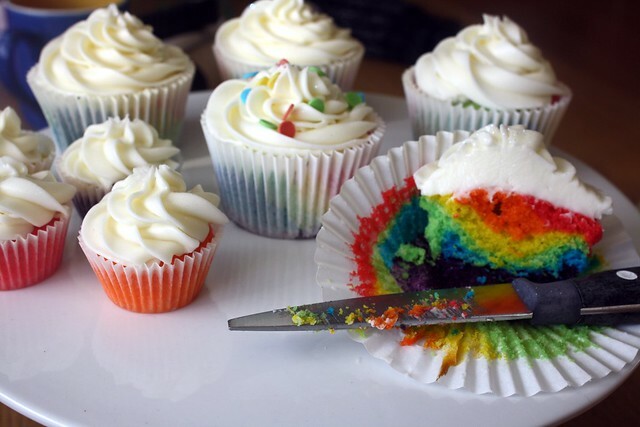 Carefully spoon one teaspoon of each colour into the cupcake case, one on top of the other. 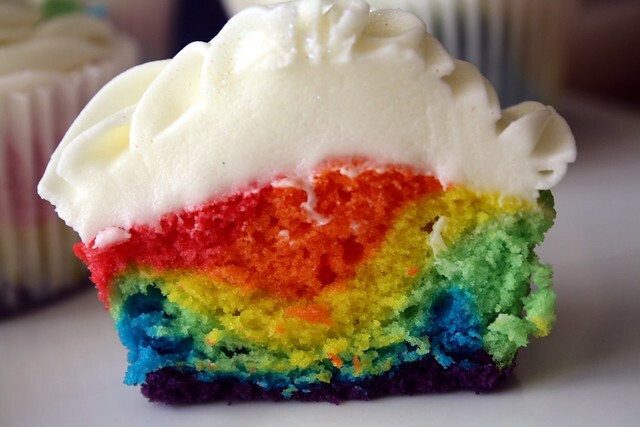 Don't attempt to spread the colour, just let the mixture do this naturally. Bake in the centre of the oven for approx 20 minutes. Check with a cake skewer in the centre of one of the cakes to see that they are cooked. 8. Leave in their tins for 10 minutes or so and then place carefully on a wire rack to cool. 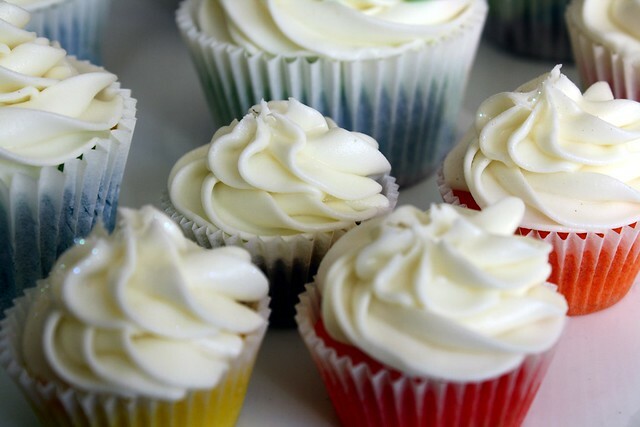 When completely cool, you can ice these cupcakes with vanilla buttercream icing. 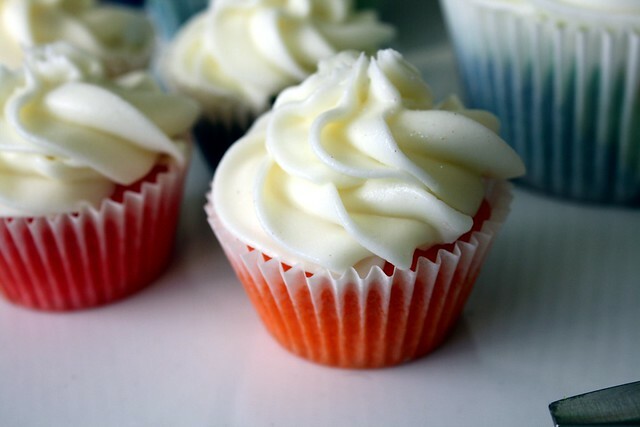 I added a little cream cheese to the buttercream to make it nice and white. I opted for no fancy decorations as I think the white is a nice contrast with the bright colours, but a little glitter dusted on livened them up! p.s. is anyone else as sad as I am over Picnik closing? I hardly managed these without it :( Any recommendations for a similar service, or will I have to attempt Photoshop? These are amazing....I really need to invest in some gel colours! They look so yum! I love picnik, I need to find an alternative too so keep me posted if you hear of anything! My photos will never be the same! 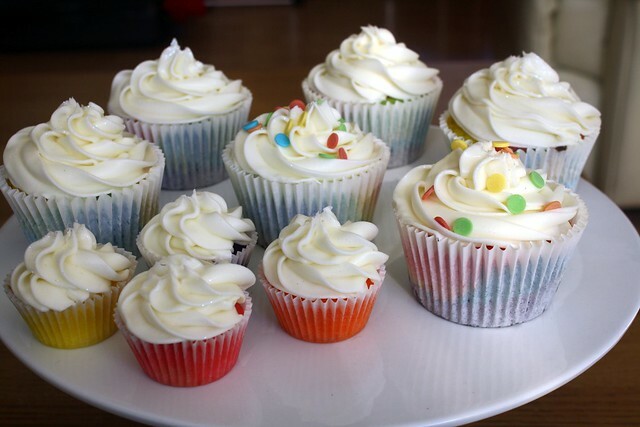 These look so, so delicious!! These look awesome, definitely going to try them out! 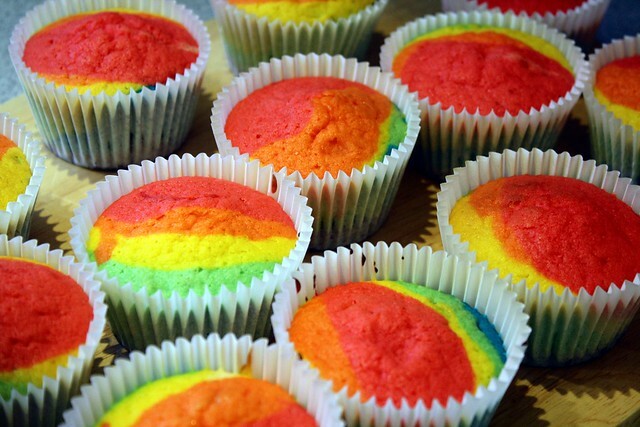 They look lovely - I think I might buy the gels you use as I've always wanted to try rainbow cupcakes but have never given them a go. Wow they are insane but look so so good. Glad to hear your little bakery is doing well! I've been searching for new photo editing things too due to the forthcoming death of picnik. I've been suggested Aviary but haven't had time to search into it yet. Aviary already work with Flikr too. These look fantastic!!! I wish I lived in Belfast, I'd be down every Sunday buying your buns!! Claire these are AMAZING!!! I need one nowwwww! Is it City Picnic that's closing? I've never actually been into it. Keep thinking it looks nice though. Sad face. Google Plus has all the Picnik features now. If you upload photos onto there, and click creative kit, it's all the same controls. A bit more of a faff as you have to get an account and all that, but it's the Picnik results we know and love. Omg! 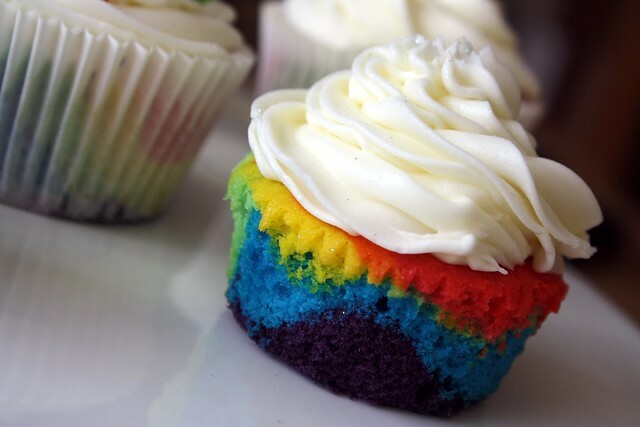 These look amazing and I bet they taste amazing too. I will defiantly have to try this. Those are so beautiful! 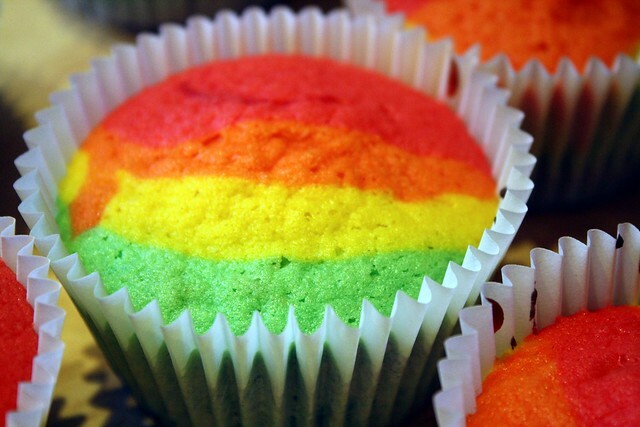 I'll have to surprise my niece with rainbow cupcakes soon! She wanted a rainbow cake for her birthday, but with the hectic birthday plans we had, I didn't have time to make one. I was pretty disappointed that Picnik is no more, too. Maybe you could try PicMonkey? From the dabbling I've done with it, it seems pretty nice! My friends and I just made the layered rainbow cake you posted on here before, which was delicious (you can see our version at http://fashionwaffle.blogspot.com). 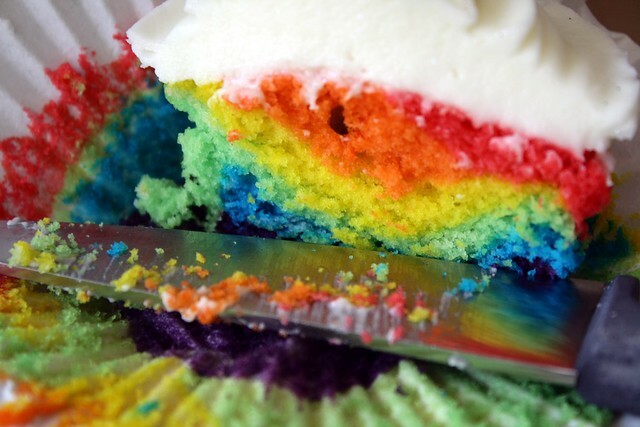 I have no doubt we'll be wanting to make these soon too! They look wonderful! OMG THESE ARE SOOOOOOOOOOOO AWESOME!!! These are AMAZING, I will definitely be trying these! As for an alternative to Picnik - I'm loving www.picmonkey.com which is very similar to Picnik!! A month of Instagram: March 2012.